1. A pro-girl and girls-only environment that is physically, socially, and emotionally safe and confirms that girls can succeed and deserve to be taken seriously for the persons they are now and the women they will become. 2. Trusting, mentoring relationships with adult staff and volunteers trained in an approach that is grounded in a belief in girls’ rights and abilities. 3. Holistic, compensatory, and intentional programming focused on girls’ needs and that provides exposure to a wide variety of experiences and options that girls might not have experienced otherwise. 4. Relevant, field-tested, and research-based curricula that confront the serious needs of girls while building the knowledge, skills, and attitudes to enable girls to be competent, confident individuals and adult women. Let them make big, interesting mistakes. Girls who are overly protected in the lab or on the playground have few chances to assess risks and solve problems on their own. At Girls Incorporated, once dreaded mistakes become hypotheses. Girls are urged to go back to the drawing board to figure out why their newly assembled electric door alarm doesn't work or their water filter gets clogged. Supported by adults instead of rescued, girls learn to embrace their curiosity, face their fear, and trust their own judgement. Help them get past the “yuk” factor. Girls who are afraid of getting dirty aren't born that way — they're made. Girls Incorporated encourages girls to put concerns about their “femininity” aside and get good and grubby digging in a river bed or exploring a car engine. Girls learn they have a right to be themselves and to resist pressure to behave in gender-stereotyped ways. 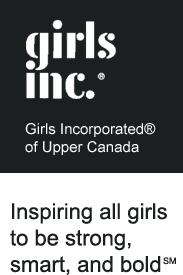 The mission of Girls Incorporated of Upper Canada is to inspire all girls to be strong, smart, and bold. We strive to be the premier organization that helps all girls to realize their potential and exercise their rights. We change the lives of girls by providing mentorship and skills development programs that help them achieve their full potential. These programs address self reliance, life skills, careers, health, well being, and leadership development. Combined with related activities, these are designed to inspire girls to make educated and conscious choices in their lives. A day-long Strategic Planning session with the Board and Staff of Girls Incorporated of Upper Canada resulted in a bold, forward-thinking, ambitious and achievable Plan that will move the organization purposefully into its’ next chapter. We were incorporated in 1979 as Big Sisters Association of Leeds and Grenville. Following a merger between Big Sisters of Canada, Big Brothers of Canada and Big Sisters Association of Ontario our organization made a decision to continue providing gender specific programming under the Girls Incorporated umbrella. Our membership and Board of Directors chose Girls Incorporated because of its close fit in philosophy, programs, and mission. As a Girls Inc. member organization, we remain committed to being the community leader of girls' services through quality group programs and mentoring. We look for ongoing opportunities to reach girls in every community. We are pleased that United Way has provided continual funding to help support Big Sisters and now Girls Inc. since 1980. Members meet regularly, on the third Tuesday of the month, to discuss and make decisions regarding the ongoing operation of our growing organization. The Board of Directors is always welcoming new committee members to our Fund Development Committee and our Nominating & Governance Committee. Please email us if you are interested in volunteering with a committee. Our Board members meet the third Tuesday of every month. Girls Inc. is always welcoming new committee members to our Fund Development Committee and our Nominating & Governance Committee. Learn more by visiting our Volunteer page. This website is generously hosted by Storm Internet Services. This website project was funded by the Brockville and Area Community Foundation.